A dental implant is a human-made substitute for the root of a missing natural tooth. Dental implants can be placed in both the upper or lower jaws. 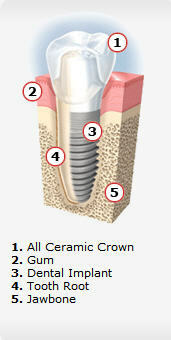 A dental implant fuses with the bone and becomes an anchor for the replacement tooth. Dental implants can be used to replace one or more missing teeth. Without the root of a natural tooth present, your jawbone can shrink. This shrinkage can make you look older than you are. A dental implant is comfortable. No adjustment is needed after placement. Normally, it will serve you for life. The fee for tooth replacement with dental implants depends on several factors, including the number of teeth being replaced and the number of dental implants required to support your replacement teeth. Some additional procedures may be required prior to the placement of your dental implants to ensure the long-term health of your dental implants. To obtain a cost estimate, we must examine your mouth. After a thorough examination, we'll recommend what we believe is best for you.